Europe-Germany-Cologne I have been to Cologne so many times with work and always in January, Not the best time to visit as can be quite cold to say the least. 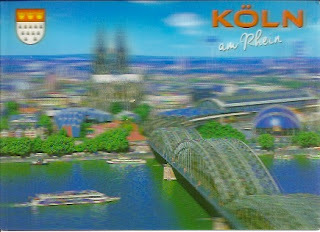 Here is one of those Postcards that has a movable image. Hard to see here. The Post office I normally visit had no choice of stamps. Just definitives. But at Cologne Airport I was able to get a small choice.